Photo: Andrian Valeanu (Unsplash, CC). Many churches struggle to understand how to include their most creative people into their ministry. “In our churches we have somehow believed that conservative is better [...] and we offer the same meal week, after week”, Kelley pointed out in an interview during the European Leadership Forum in Wisla (Poland). “Artists are the most influential people in the community [...] they are the ones who change culture”, he concludes. Question. Why do many artists dislike the church? Answer. Many artists dislike the church because the church does not validate them. The church talks about spiritual gifts, with spiritual language, but tends not to recognize musical and artistic talent as spiritual talent. And yet, the first time in the Scriptures where talks about the Holy Spirit giving gifts is in the context of building the tabernacle, in the Old Testament, and the first gifts that the Spirit gave were artistic gifts, given to the artists, to the craftsmen, the jewellers, the goldsmiths, the tapestry makers. But they are not listed in the four major passages of the New Testament that address spiritual gifts: 1 Peter, 4; 1 Timothy, 4; Romans, 12; 1 Corinthians, 12. The artistic people, the creative people are not affirmed for having talents that are spiritual as other talents. There is another thing as well: many of the good artists play instruments that are not traditionally used at church. We can do something that would surprise the congregation, that would actually make them listen, to catch their attention, because when we catch their attention with something that surprises them, they actually do not go to sleep. And I think this is very Christlike, because the Lord Jesus was accused of many things during His ministry, but He was never accused of being boring. He was always surprising people, with his stories, his illustrations and with his actions. But in our churches we have somehow believed that conservative is better and it means that we take very few risks, and we offer the same meal week, after week, after week, which offers little surprise and a high level of boredom. My mentor, many years ago, at Dallas Seminary, was Howard Hendricks, and he used to say: “Men, it is a sin to bore people with the Word of God”, and then he started to talk about how thousands of pastors were profoundly sinning every Sunday. I agree with that, I think every sermon should be interesting, creative, relevant to life, and have surprise factors in it, but I also think that every service should. And I think is a sin to bore people with services that are utterly predictable, so that people know what time they close their eyes and open them again in the middle of the service, to have missed absolutely nothing. Q. 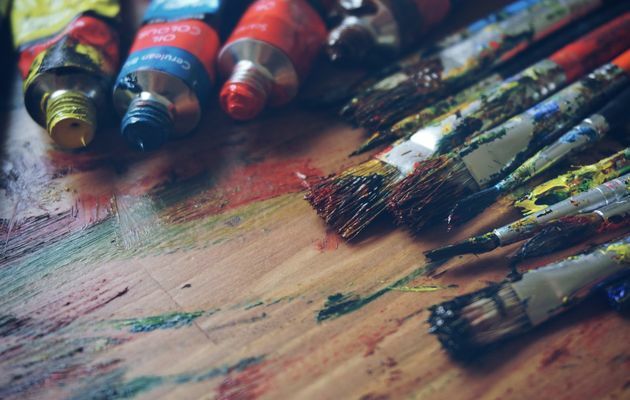 Why do many Christian leaders avoid using art and artists in their ministry? A. Many Christian leaders avoid using art and artists in a creative way in their ministries because of theological reasons: they do not want to violate the second commandment which has to do with graven images. Some conservative interpretations of graven images, prohibit people from thinking about creatively depicting Christian symbols, specially symbols of God, or Jesus, or the crucifixion, or the resurrection, or anything hat is sacred,that would be idolatry for them. Other avoid them because of their own background, some come from Catholic background, where they have felt there was too much emphasis given to the art and the artist, and they do not want to be dominated by that anymore. There are some who have not been taught or trained to think creatively, because our Bible Schools and Seminary systems seem to attract people who have strong left brains and can think like engineers, systematically and very logically, and creative right brain people often feel out of place in the Seminary world. I am one of them, for example. I have 7 years of theological training, in some of the finest theological seminaries in the world, and I have always felt out of place and seldom felt affirmed whenever I wanted to do something creative. Thus, when you go into ministry and you have been trained to do things like you have been trained, creativity is not seen as a good thing, but as a risky thing. In fact, creativity is the capacity to take a risk, and our churches are often churches that pride themselves on not taking risks. There is not such thing as creative creativity apart from the artists taking the risks. There are other other reasons as well why the churches or the leaders would avoid involving art or the artists, or people from that background. One of them has to do with worldliness: sometimes artists or musicians come from some pretty raw backgrounds, and they may bring some skills they learnt in the world into the church. Ant the questions come up: Are they going to bring their values with it? Are they going to bring our young people down? Do we want to pollute our young people with this? That is another reason why some would be afraid of it, and I can understand it. But at the same time, when churches avoid creativity, and avoid involving creative people in their churches, they lose them. The most fine artists and musicians that I know do not have a place in the church, and it is just a matter of time that they do not go to church at all. Q. How can you embrace the artists in your church? Now we are talking a different story, and that is the story that transforms churches, because you are involving people, not to just do tasks, but to volunteer their core strengths, and that is really important. I was a pastor for 21 years, but I did not know how to paint until I was 50, and now I am also a professional painter. I did not know what to do with professional painters in my church when I was a pastor. I look back now and I feel ashamed of it, I wish I have had more creativity. I wish I had reused my church as a place where we could do exhibitions for artists in the community, so that we can build the bridge to the artists and invite them to come and bring their friends, and look at their art. We can even offer to do the open exhibition for them, provide the coffee, the tea, the doughnuts, and even some of the music, so that we develop relationships with them, and we creatively use the facilities that God has given us to build bridges with the community. Artists are the most influential people in the community and in society, they are not the thermometer, they are the thermostat. The life-changing people in the last 30 years, except for a few politicians, almost all of them are artists or musicians, and they are the ones who change culture. Watch the video of this interview and other resources by Charles David Kelley on the Forum of Christians Online website.